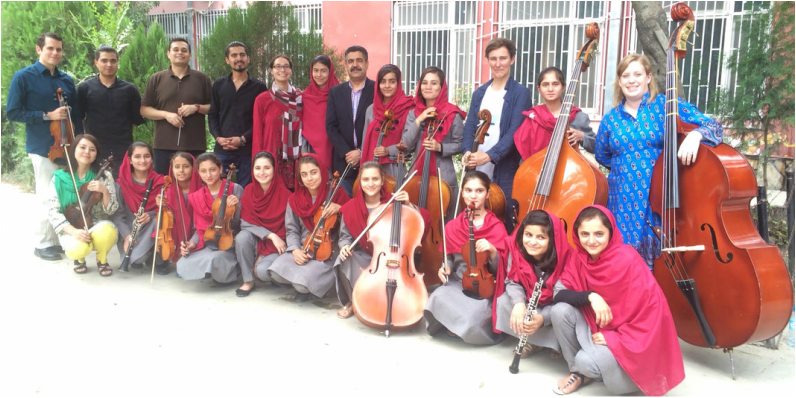 educational gap, a culture of violence against women, and cultural restrictions on music-making by women – and yet, against these odds, they come to school each day, and in August 2015 they recorded the interludes to Gulistan-e Nur: The Rosegarden of Light. These young women are leading a peaceful and beautiful fight for female education and equal rights within their country and, through projects such as ‘The Rosegarden of Light’, will become an inspiration to many others around the world. For these recordings, Ensemble Zohra was conducted by Camilo Jauregui, and joined by ANIM teachers Jennifer Moberg (violin), Kevin Bishop (violin), Holly Bishop (double-bass), Diana Mukhametzyanova (piano) and Samim Rafiqzada (tabla), with tutoring and administrative support from Allegra Boggess.